Today we started our morning with a lecture about our field trip. Then we grabbed our sack lunches and got on the bus to head to Stratford-upon-Avon. Our first stop was Anne Hathaway's cottage. It was interesting to see where there family lived. We walked through the house and then also walked through the gardens, which are usually in full bloom this time of year but since it has been abnormally cold, they were not. But it was still a beautiful area to walk around. Inside the cottage we could see the insulation they had, and they described how one could always hear rats running though it! 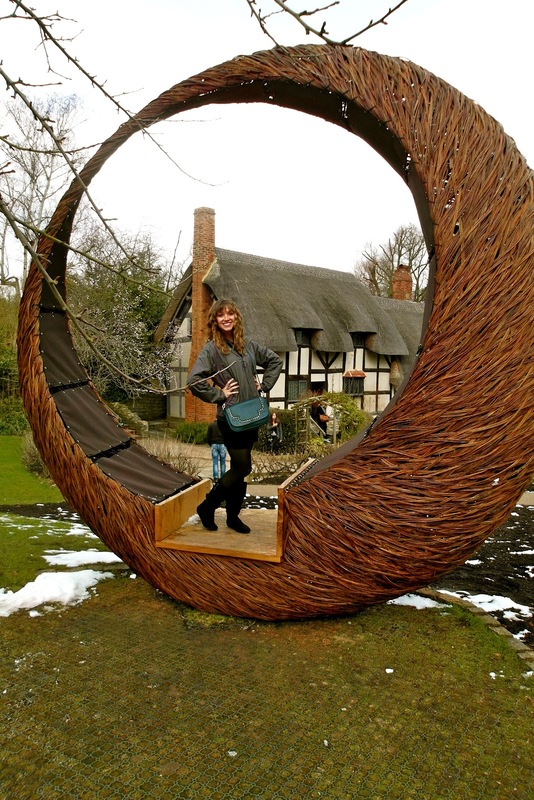 We also saw Shakespeare's courting chair it is said he used when courting Anne Hathaway. Then we went into the town more and looked at Holy Trinity Church where the Shakespere's are buried in the floor by the alter. 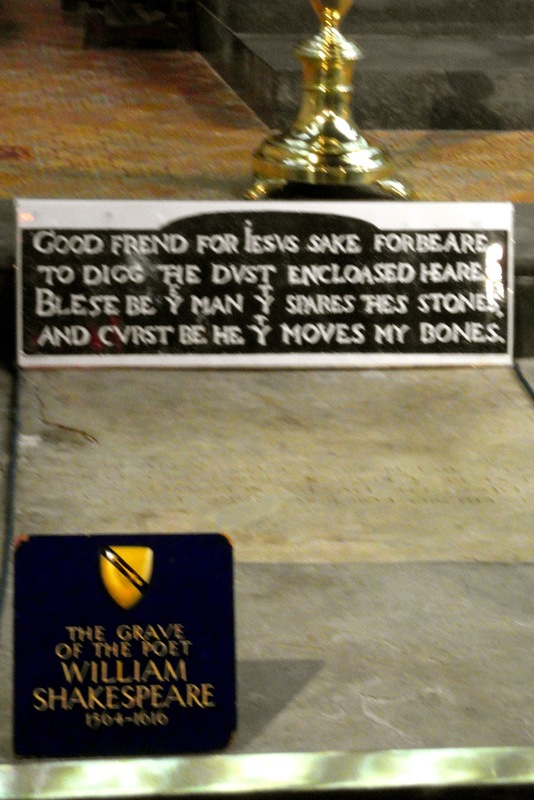 In the picture you will notice there is a sign above William's grave, this displays the words which are actually printed on his grave. 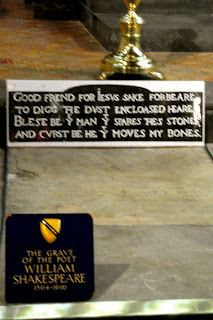 It reads, "Good frend for Jesvs sake forbeare to digg he dvst encloased heare, blese be y man y spares thes stones, and cvrst be he y moves my bones." After visiting his grave site we walked to where the house he grew up in was once located. The man who bought the home after Shakespeare, tore it down because so many people would come ask to tour 'Shakespeare's home' so he grew furious and destroyed it. Then we walked by the school that would have been where Shakespeare went to grammar school. We also walked to the place where he was born. 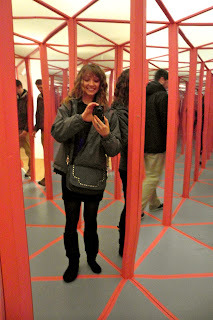 ...I also found my dream house in this town :) ---It's pink! Then we had some time to kill before we went to the Royal Shakespeare Company's production of Hamlet. So, Kelsey, David, Amy, Matt and I went to a pub and had dinner before the show. 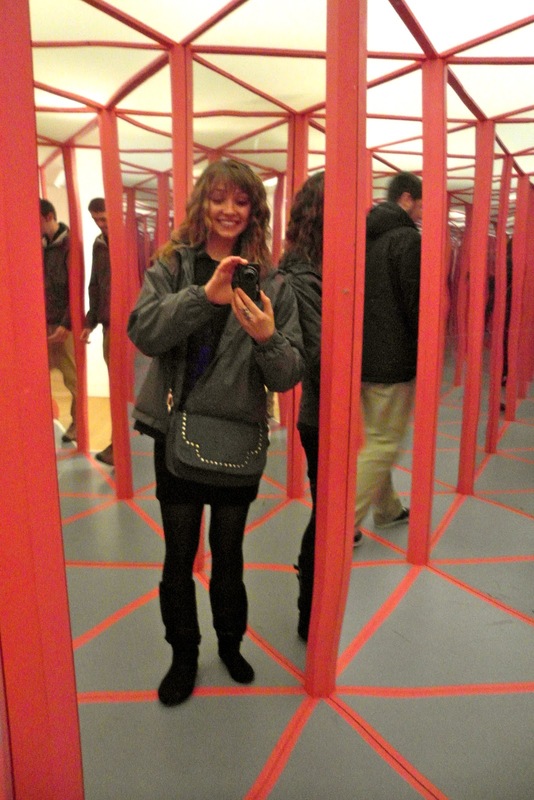 Then we went and explored in the theater and even found a mirror maze to go through before the show. Then we went to the play and it was a phenomenal experience to see a show there. They have great actors and do a fantastic job with the lighting and effects. However, I'm not sure how I felt about the modern interpretation and that they set the play in this current time. The play was four hours long and we did not get back to our hall until almost 1.